If Arsenal's 2-0 defeat to Chelsea at Stamford Bridge taught the Gunners anything, it is that their psyche in big games has to change. Simply put, Arsenal have to display more appetite and tenacity in the bigger game, especially in the Premier League. The absence of those qualities condemned the Gunners and Arsene Wenger to yet another humbling defeat against Jose Mourinho and Chelsea. Other than the two red card incidents—Cazorla stupidly getting booked a second time and Gabriel falling for Costa's antagonistic self—the Gunners showed little grit and determination. Manager Arsene Wenger will be aware of the fact that his side, confident and decisive up to this point, lacked the swagger of would-be champions at the home of the Blues. It was a mental failing that cost Wenger's players, not a tactical or talent deficiency. Yes, Arsenal do have issues on a physical level. Theo Walcott and Olivier Giroud both lack the proficiency and instincts of a natural goalscorer, and Mesut Ozil has yet to really take a big game by the scruff of the neck. But while these problems did surface against Chelsea, Arsenal were not outplayed by any means. Instead, they were outfought and guilty of timidity when presented with their own chances to seize the game. Both came in the second half, and the first involved Walcott. A peripheral figure in the game, the Walcott had his chance to make amends. The ball found itself inside Chelsea's box. As the ball rolled across the ground in front of Walcott, the opportunity presented itself for the striker to hit it with his preferred right foot. But instead, Walcott hesitated, pausing as he was about to strike and opting for another touch before goalkeeper Begović comfortably blocked the shot. The chance, an enviable chance in Walcott's eyes, had been spurned by a striker lacking the assurance of a truly predatory finisher. There is no doubting Walcott's importance to this current squad. But still, doubts remain over his ability to decide a closely fought big game with a decisive finish under pressure as the central-forward. He failed that test against Chelsea, but Walcott was certainly not alone in his failure to deliver. Step forward, Özil. Arsenal's £42.5 million man has rightly been chided for his feeble performance against the Blues. If the only audible doubt about the German international is that he sometimes drifts out of the action, then Stamford Bridge on Saturday was a day for believing such gossip. The greatest No. 10's demand the ball incessantly. They go looking for the heart of the game and attempt to shape it in their image. Özil does this often, but not every time. On his off-days, he can seem peripheral and cut-off. "Peripheral" is certainly an apt way to sum up Özil on Saturday. His periods of inactivity are often part of a trade-off. It is what he does in those quick bursts of expression, ingenuity and imagination that defines Özil's contributions to a side. That is why he can be a player that often frustrates. Premier League audiences are used to being enamored with players who visibly dominate games from start to finish. Waiting for a mercurial ace to alter from slumber to effervescence can be a frustrating experience. The problem against Chelsea was that there were no "quick bursts of expression, ingenuity and imagination." But it wasn't Özil who missed Arsenal's best chance—it was Alexis Sanchez—who was equally as ineffective. His decision to hesitate and take an extra touch after a very clever run in behind Chelsea's well-shaped back-four, picked out by a stylish pass, has rightfully drawn criticism. The most epitomized Arsenal's timidity at Stamford Bridge. The chance was there to be seized, but one of Arsenal's main men hesitated. Contrast that with the performances of Cesc Fabregas and Eden Hazard, Chelsea's heavy-hitters. While many Arsenal players shied away from the occasion, both of the former hustled and harried. Their commitment was tangible, and it yielded both decisive contributions, Fabregas' assist for Zouma and Hazard's goal. While Chelsea's players relished an outing on the grand stage, Arsenal didn't. 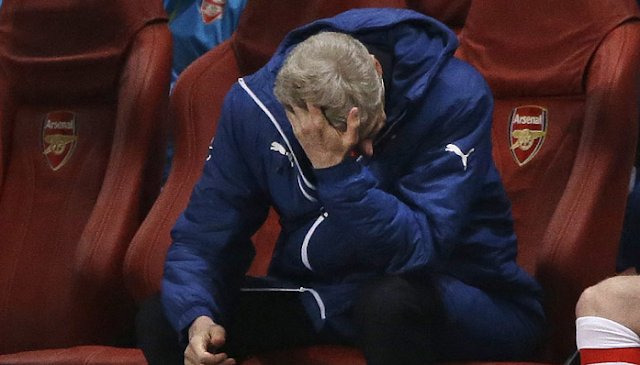 Wilting under the pressure pervaded was the entire Arsenal side. Santi Cazorla produced one of his worst performances in recent memory and was sent off, typifying the Gunners' frustration on the day. Aaron Ramsey normally delivers, but he squandered his fortrays forward and lacked precision on the ball. Nowhere in Arsenal's ranks was there evidence of the will and belief that snatched an away victory against Manchester City. Then Wenger played safety first, just as he did against Chelsea. He was right on both occasions, but his side did not have the gumption to seize their chance as underdogs on the big stage, as they did last February. Against Chelsea, they looked a group of players overawed by the occasion and still not convinced they belong on the big stage. If Arsenal are going to win a major trophy, they cannot lose significant portions of key games to nerves. They have to reverse they inferiority complex against the other members of EPL elite. Arsenal's current title hopes have not been fatally derailed by a narrow defeat to Chelsea—far from it. But to win the major prizes, the Gunners must start defeating the sides that have been collecting the trophies they are so desperate to claim. Wenger's men have a pair of fixtures against City and United to come, as well as the return fixture against the Blues. That means they'll have five opportunities to improve their psyche in marquee games and show their mettle in big occasions. If they can't, Arsenal will be a team talented enough to win major trophies, but one inevitably let down by stage fright.